Reclaimed teak desktops may come with repairs to imperfections in the wood. Please see the above image for an example of what you may receive. Get the rustic office desktop of your dreams with an UPLIFT Rectangular Reclaimed Wood Desktop, available in beautiful Douglas Fir and Teak. If you're on the search for the natural beauty of a real wood desktop but don't want to chop down a tree to get it, we have you covered. Rectangular Reclaimed Wood Desktops by UPLIFT are budget- and eco-friendly solutions for a natural wood sit-stand desk. Simply pair with one of our UPLIFT desk frames for a fully functional adjustable height desk. 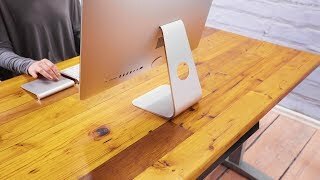 Enjoy the look and feel of real wood that was naturally sourced, giving it new life as a functional standing desktop that's ready to take your work to the next level. Choose from several desktop sizes for nearly any workstation setup you need. This listing is for the desktop only. Due to the one-of-a-kind nature of the lumber, reclaimed wood desktop colors may vary slightly from what you see here. Reclaimed teak desktops may come with inlaid patches to repair imperfections in the wood. Please click for an example of what these patches look like. These reclaimed desks come from our artisans in California, who specialize in restoring hardwoods, granting a second life to very hardy materials. Each top is unique, and your finish may vary. Douglas fir tops come with a plywood backing. Restored to like-new condition, this reclaimed, upcycled wood doesn't even look like it led an entirely different life before becoming your new desk. Each top is different, so your finish may vary. 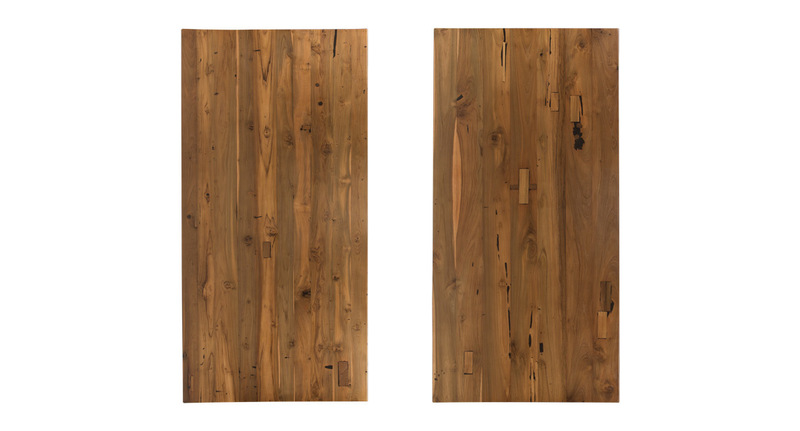 Reclaimed teak desktops may come with inlaid patches to repair imperfections in the wood. Please click for an example of what these patches look like. Reclaimed desktops are available in 30'' depths and a variety of different widths: 42", 48", 60", and 72". Douglas Fir tops are also available in 24" depths on 42", 48", 60" and 72" widths. Douglas Fir desktops are 1.5" thick while Teak desktops are 1.25" thick.